When approaching the difficult task of accessing websites and online accounts, dealing with it is divided between two options: having the password or not having the password. If you have neither a password nor access to an e-mail account, the dealings get more complicated, because they involve approaching the online services providers. 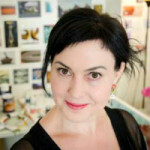 Some are already set for dealing with death of clients and present clear policies and guidelines in this regard, but some are still grappling with it or have done so until recently. Twitter, for instance, published their policy only in August 2010. 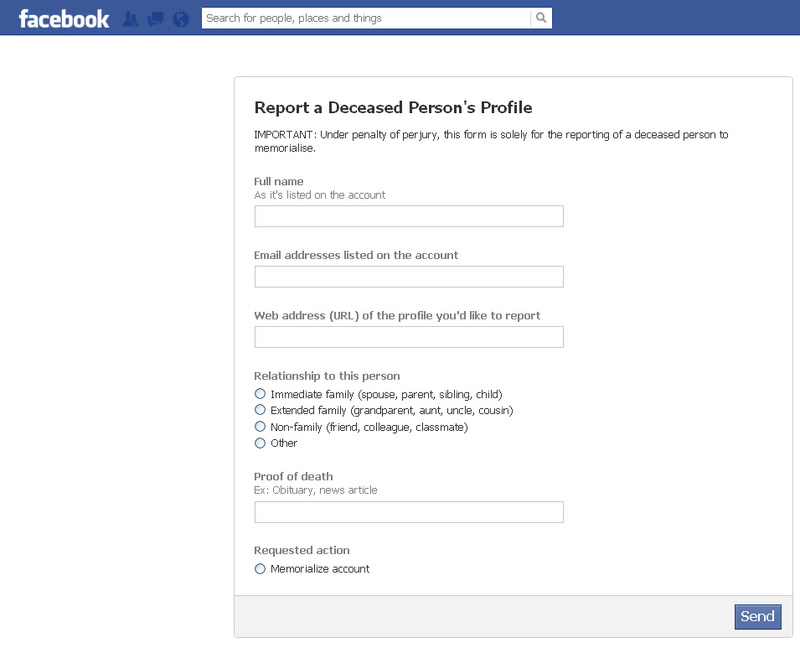 On facebook, for instance, at any moment someone might turn his or her profile into a memorial profile (your consent isn’t required and you’ll find yourselves locked out of the account – even if you have a valid password). Therefore, the first thing I recommend you do is download a copy of the profile’s content (for “how to” scroll down, under “Facebook”). Sometimes you’ll have access to accounts only for a limited amount of time: if the deceased passed away while his / her smartphone / tablet / laptop / computer was still logged on, you would still have access through this device to his or her online accounts. But eventually you’ll be prompted to re-enter the passwords, and when you can’t provide one, you’ll be locked out of these accounts. Therefore, I recommend you take advantage of this access while you have it, and set as many new passwords as you can, to ensure you have independent access to the accounts – at least to begin with. Maybe later on you’ll decide to close the accounts, or not to go into them, but at least you’ll have a choice. I know you already have so much to handle after the death of a loved one, and maybe his or her digital legacy doesn’t strike you as urgent, but unfortunately, by the time you do get around to dealing with it, it’ll be too late, and invaluable, precious data will be permanently lost – in a way which cannot be restored. Entrustet used to have a wonderful blog, and in it a “Digital Executor Toolbox” could be found. Unfortunately, when Entrusted was purchased by SecureSafe, the blog went offline, which is a pity. It used to have useful information about how to close online accounts and delete digital assets after the user has passed away. I hope it will go online again. In the meanwhile, I have compiled a list here for your convenience. A click on each link will take you to the relevant page of the online service provider. Between the time I wrote this post as a draft and print-screened this page and the time I published this post, YouTube took their policy offline. 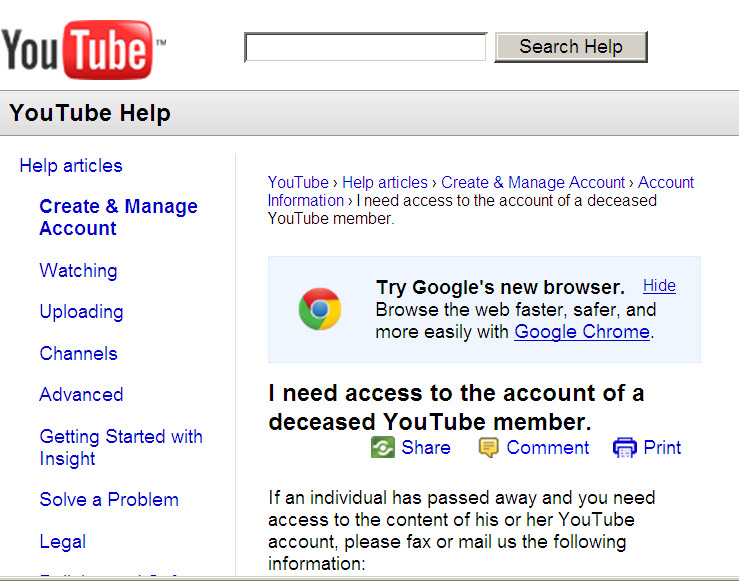 Right now there isn’t an online policy regarding a deceased YouTube member’s account. I’ve sent YouTube a query about this and will update this post once I have news. “We will only remove or preserve the profile of a deceased user at the request of the next of kin or at the request of the executor of the estate. 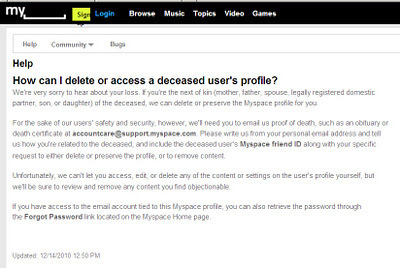 Myspace will not allow access or update the log-in information for a profile for any circumstance… However, if you have access to the email account tied to the Myspace profile, you can retrieve the password by clicking www.myspace.com/auth/resetpassword“. 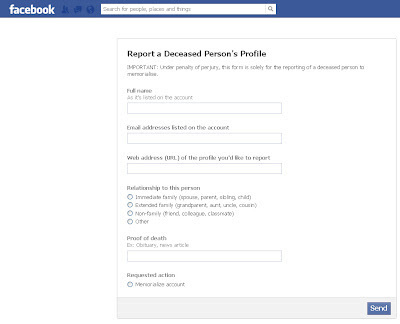 The only right reserved to members of his / her immediate family is to ask for the profile to be deleted: How do I submit a special request for a deceased user’s account on the site? and then “If you are an immediate family member and would like to request that we remove your loved one’s account from the site, click here“. Following John Berlin’s appeal to see the ‘Look Back’ video of his deceased son, Jesse Berlin, Facebook now allows members of a deceased user to watch his or her ‘Look Back’ video. Please note: a request to see a Look Back video of a user who passed away equals a request to memoralize the account, even if this wasn’t your intention, so please make sure you understand the consequences of your act before making this request. If you are certain you wish for his or her account to be momoralized, or if the account is already memoralized, you can make the request here. Thank youDamien McCallig for highlighting this point. Facebook took this opportunity to also change the privacy settings of memoralized accounts: from now on, the content will remain visible as the owner defined it while he/she was still alive. Meaning: if certain content was made visible publiclicly, it will remain so. If certain content was made visible to friends of friends, it will remain so – unlike what the policy was up until now: that once an account was memoralized, all the content was visible to friends only. 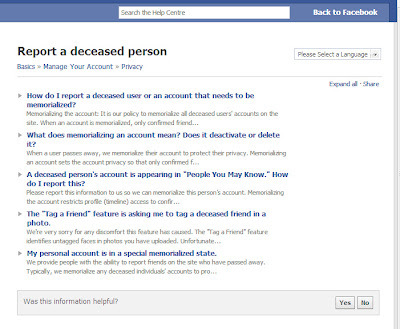 A word about Facebook‘s policy of memorializing an account: Of course this is very personal, but I think and feel it is better to keep “running into” my dead brother’s profile on Facebook as if he were still alive, than to have his profile declared as a profile of a dead person. I do not wish for certain content out of his profile to disappear, as it will disappear without any of us having a say about what stays and what disappears – it is determined by Facebook’s policy only. Ever since my brother was killed, he has received hundreds of friendship requests, and as far as I can tell, all are by people who realize he is dead. I am puzzled by this: Is it their initiative, or in response to Facebook suggesting him as a possible friend? Is it their way of showing their respect to him? Their way of expressing their sorrow over missing out the opportunity to be his friends while he was still alive? Do they expect their request of friendship to be accepted? Is there a bit of voyeurism in it – to see which content they will be granted access to as friends, that they couldn’t see before? How would they feel if “he” will suddenly approve their request, since it will be clear it was not done by him but by a family member? Since approving a friendship request grants access to certain content which only friends can see, I feel no one has the right or authority to approve friendship requests but the deceased. None of the Israeli companies publish their policy regarding death of a client online. 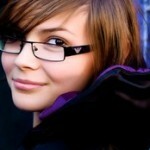 I gathered the following information from each one as a service to the readers of this blog. Walla! will grant you the password to the mailbox as soon as you follow their clear policy in this regard. Email them at: support@walla.net.il and ask for a copy of their instructions in English (In a nutshell, you will need to provide both proof of death and proof of your relation to the deceased). You should contact them as soon as you can: an e-mail account that hasn’t been used in 3 months might be closed by the company. Unfortunately, there is no point in contacting this company. They will only grant access to the e-mail under court order. Contact your lawyer instead. You can notify Bezeq International someone has passed away either by phone: *3014 or by chat with a customer service representative. You will only need to supply the ID number and the last fourdigits of the method of payment of the deceased, and they will give you the e-mail password. You will need to provide a copy of a death certificate, oddly enough, not in order to gain access to the e-mail account, but in order to receive a refund for unused Internet services. If you wish to keep the e-mail active, you can do so: the first 6 months for free, and from the 7th months onward by paying 9.90 NIS per month. You can notify TheMarker Cafe by phone 03-5133697 or e-mail support@themarker.com, but they will only grant access to the account under court order. You can notify Netvision by phone: *3013 or by e-mail service@netvision.net.il. As soon as you present a copy of the death certificate, ID number and last four digits of method of payment, you will be granted full access to all the services the deceased was subscribed to – including e-mail and cloud backup. This is relevant however only if they had a private account. If they had a business account, only the owner of the company can contact Netvision, or the person registered at Netvision as the contact person for the company the deceased person worked for. You will have to have a Hebrew speaking person next to you, as Tapuz can only be contacted by a Hebrew form in their website. They will only assist you in gaining access to the account if you have access to the e-mail address that the person who passed away registered with. If you don’t, they will assist you only if there is a legal cause for it, or under court order. Isra-Blog is part of Nana10 and can be notified about a death of a blogger by e-mail: israblog@nana10.co.il. They don’t have a consistent policy: in some cases, the blog will be taken offline. In other cases, a family member will be granted access to it – depending, among other factors, on the family wishes. You can contact Nana10 by e-mail support@nana10.co.il, but access to the mailbox will only be granted under court order. 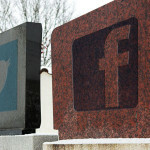 What is so frustrating about the long, complex dealings with the various Internet providers and their different policies – which includes heartache and helplessness – is that the people left behind after the death could have easily been spared all that – if only the deceased had left their usernames and passwords behind. 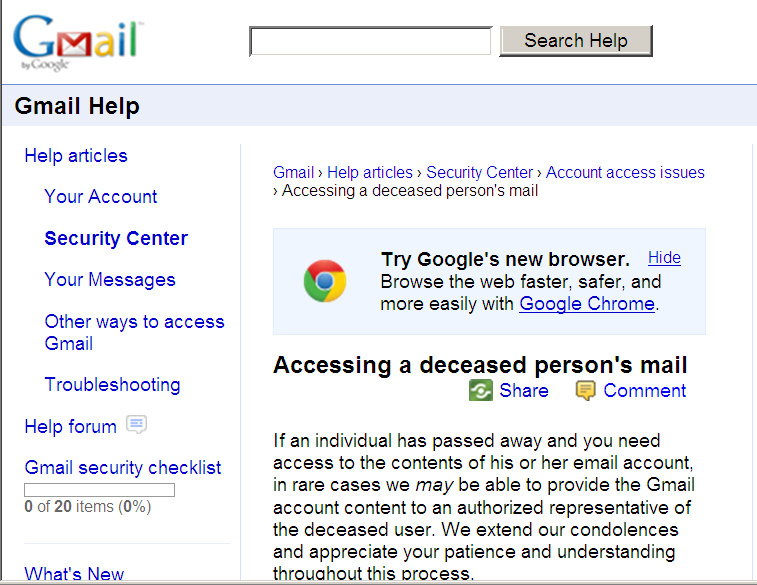 They could have accessed their accounts without the provider ever knowing the user was dead. Several products (some of them for free) offer this exact service: keeping track of websites, user names and passwords, along with instructions of who may access what, are detailed in this post: Managing Your Digital Legacy. On facebook, for instance, at any moment someone might turn his or her profile into a memorial profile (your consent isn't required and you'll find yourselves locked out of the account - even if you have a valid password). Therefore, the first thing I recommend you do is download a copy of the profile's content (for "how to" scroll down, under "Facebook"). Sometimes you'll have access to accounts only for a limited amount of time: if the deceased passed away while his / her smartphone / tablet / laptop / computer was still logged on, you would still have access through this device to his or her online accounts. But eventually you'll be prompted to re-enter the passwords, and when you can't provide one, you'll be locked out of these accounts. Therefore, I recommend you take advantage of this access while you have it, and set as many new passwords as you can, to ensure you have independent access to the accounts - at least to begin with. Maybe later on you'll decide to close the accounts, or not to go into them, but at least you'll have a choice. I know you already have so much to handle after the death of a loved one, and maybe his or her digital legacy doesn't strike you as urgent, but unfortunately, by the time you do get around to dealing with it, it'll be too late, and invaluable, precious data will be permanently lost - in a way which cannot be restored. Entrustet used to have a wonderful blog, and in it a "Digital Executor Toolbox" could be found. Unfortunately, when Entrusted was purchased by SecureSafe, the blog went offline, which is a pity. It used to have useful information about how to close online accounts and delete digital assets after the user has passed away. I hope it will go online again. In the meanwhile, I have compiled a list here for your convenience. A click on each link will take you to the relevant page of the online service provider. "Please note: We are unable to provide login information for the account to anyone regardless of his or her relationship to the deceased." 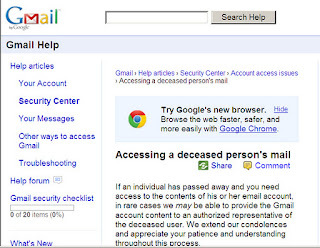 "If an individual has passed away and you need access to the contents of his or her email account, in rare cases we maybe able to provide the Gmail account content to an authorized representative of the deceased user. .... Any decision to provide the contents of a deceased user’s email will be made only after a careful review, and the application to obtain email content is a lengthy process. Before you begin, please understand that Google may be unable to provide the Gmail account content...."
Between the time I wrote this post as a draft and print-screened this page and the time I published this post, YouTube took their policy offline. 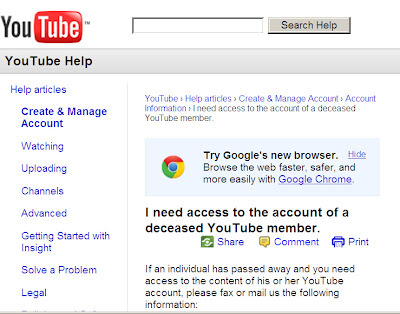 Right now there isn't an online policy regarding a deceased YouTube member's account. I've sent YouTube a query about this and will update this post once I have news. 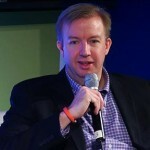 "The Microsoft Next of Kin process allows for the release of Hotmail contents, including all emails and their attachments, address book, and Messenger contact list, to the next of kin of a deceased or incapacitated account holder and/or closure of the Hotmail account, following a short authentication process. We cannot provide you with the password to the account or change the password on the account, and we cannot transfer ownership of the account to the next of kin. Account contents are released by way of a data DVD which is shipped to you." 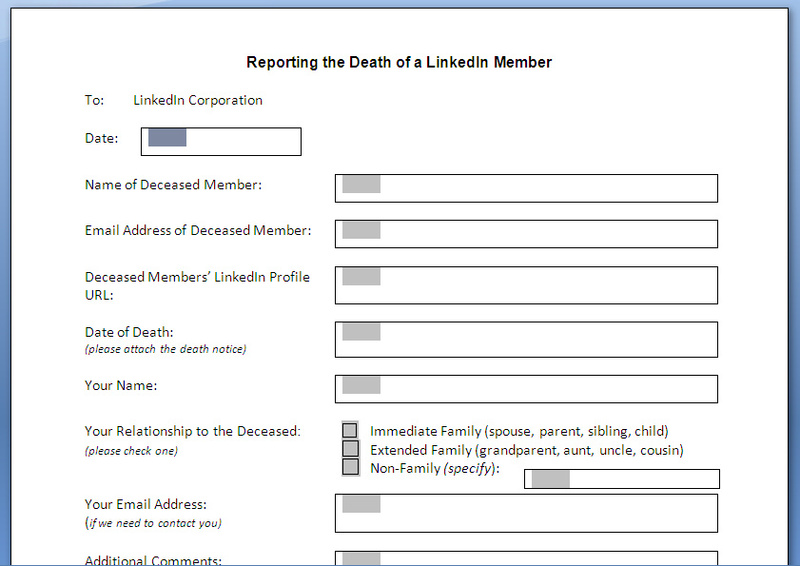 "To close the account of a deceased LinkedIn member you'll need to submit a Verification of Death form. Note: This form requires an email address registered to the deceased member's account. Without this important piece of information, we will not be able to address your request." "We will only remove or preserve the profile of a deceased user at the request of the next of kin or at the request of the executor of the estate. 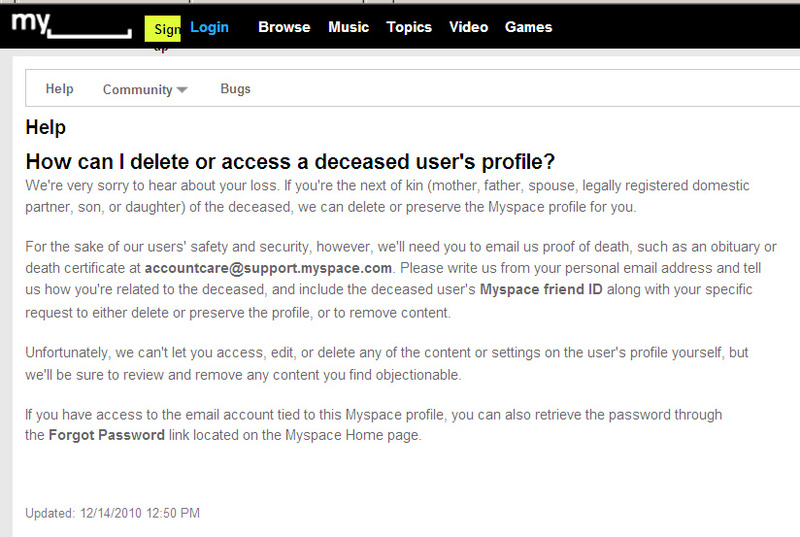 Myspace will not allow access or update the log-in information for a profile for any circumstance... However, if you have access to the email account tied to the Myspace profile, you can retrieve the password by clicking www.myspace.com/auth/resetpassword". "In order to protect the privacy of the deceased user, we cannot provide login information for the account to anyone." 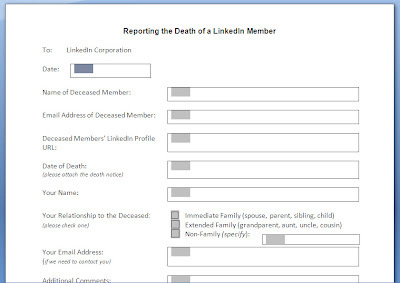 The only right reserved to members of his / her immediate family is to ask for the profile to be deleted: How do I submit a special request for a deceased user's account on the site? and then "If you are an immediate family member and would like to request that we remove your loved one's account from the site, click here". Following John Berlin's appeal to see the 'Look Back' video of his deceased son, Jesse Berlin, Facebook now allows members of a deceased user to watch his or her 'Look Back' video. Please note: a request to see a Look Back video of a user who passed away equals a request to memoralize the account, even if this wasn't your intention, so please make sure you understand the consequences of your act before making this request. If you are certain you wish for his or her account to be momoralized, or if the account is already memoralized, you can make the request here. Thank you Damien McCallig for highlighting this point. Facebook took this opportunity to also change the privacy settings of memoralized accounts: from now on, the content will remain visible as the owner defined it while he/she was still alive. Meaning: if certain content was made visible publiclicly, it will remain so. If certain content was made visible to friends of friends, it will remain so - unlike what the policy was up until now: that once an account was memoralized, all the content was visible to friends only. 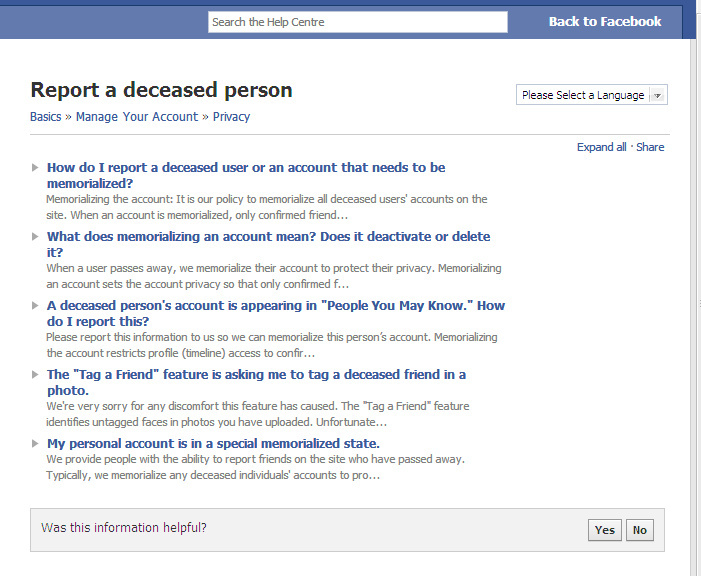 A word about Facebook's policy of memorializing an account: Of course this is very personal, but I think and feel it is better to keep "running into" my dead brother's profile on Facebook as if he were still alive, than to have his profile declared as a profile of a dead person. I do not wish for certain content out of his profile to disappear, as it will disappear without any of us having a say about what stays and what disappears - it is determined by Facebook's policy only. Ever since my brother was killed, he has received hundreds of friendship requests, and as far as I can tell, all are by people who realize he is dead. 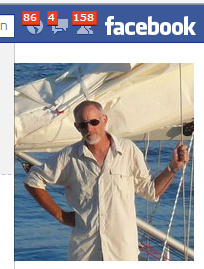 I am puzzled by this: Is it their initiative, or in response to Facebook suggesting him as a possible friend? Is it their way of showing their respect to him? Their way of expressing their sorrow over missing out the opportunity to be his friends while he was still alive? Do they expect their request of friendship to be accepted? Is there a bit of voyeurism in it - to see which content they will be granted access to as friends, that they couldn't see before? How would they feel if "he" will suddenly approve their request, since it will be clear it was not done by him but by a family member? Walla! will grant you the password to the mailbox as soon as you follow their clear policy in this regard. Email them at: support@walla.net.il and ask for a copy of their instructions in English (In a nutshell, you will need to provide both proof of death and proof of your relation to the deceased). You should contact them as soon as you can: an e-mail account that hasn't been used in 3 months might be closed by the company. You can notify Netvision by phone: *3013 or by e-mail service@netvision.net.il. As soon as you present a copy of the death certificate, ID number and last four digits of method of payment, you will be granted full access to all the services the deceased was subscribed to - including e-mail and cloud backup. This is relevant however only if they had a private account. If they had a business account, only the owner of the company can contact Netvision, or the person registered at Netvision as the contact person for the company the deceased person worked for. You will have to have a Hebrew speaking person next to you, as Tapuz can only be contacted by a Hebrew form in their website. They will only assist you in gaining access to the account if you have access to the e-mail address that the person who passed away registered with. If you don't, they will assist you only if there is a legal cause for it, or under court order. Isra-Blog is part of Nana10 and can be notified about a death of a blogger by e-mail: israblog@nana10.co.il. They don't have a consistent policy: in some cases, the blog will be taken offline. In other cases, a family member will be granted access to it - depending, among other factors, on the family wishes. What is so frustrating about the long, complex dealings with the various Internet providers and their different policies - which includes heartache and helplessness - is that the people left behind after the death could have easily been spared all that - if only the deceased had left their usernames and passwords behind. They could have accessed their accounts without the provider ever knowing the user was dead. 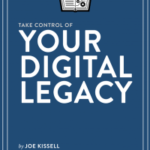 Several products (some of them for free) offer this exact service: keeping track of websites, user names and passwords, along with instructions of who may access what, are detailed in this post: Managing Your Digital Legacy.